In our last Daddy ‘Do hairstyle, Four-Strand Ponytail, my husband showed a feather headband that we had made. We received so many comments asking us how to make these headbands, so we decided to film a tutorial for you all. 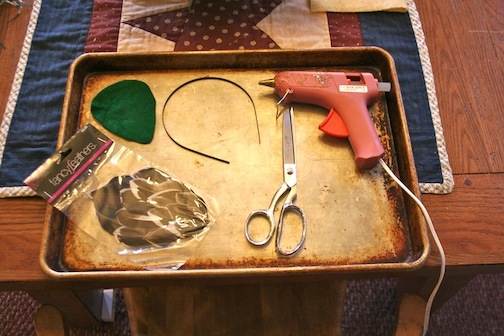 I first bought one off of Etsy a year ago for between $16-20, and I loved it… but one day while browsing through Hobby Lobby, I saw that they sold pre-glued feather patches. I was sooooo excited! And they were listed at $3.99 each, however I bought them on sale for half that price. I have since seen that Michael’s also sells them. 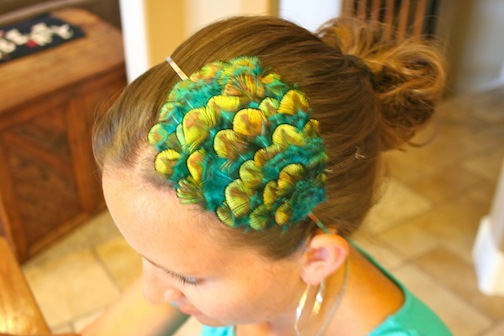 I recognize that feathers as accessories may not be ideal for everyone, but they certainly are a trend right now. I figure that I had less that $4 into each headband, which is far less expensive than $16 or so online! Plus, it can be a fun craft to do with your darling daughters! I now have six different headband styles that we have made. Items Needed: Feather patch, scissors, felt, simple wire headband, hot-glue gun. If you felt that this tutorial was helpful, please do let us know! Happy Hairdoing!